A mermaid was spotted in 1826 by a farmer who lived near the shore. According to his report the mermaid looked as though she was washing herself, he realised that it had to be a mermaid as the water was very deep there. The farmer’s children joined him in watching the figure for some time until the wife, coming to see where they had all gone, scared the mermaid away farther down the coast. 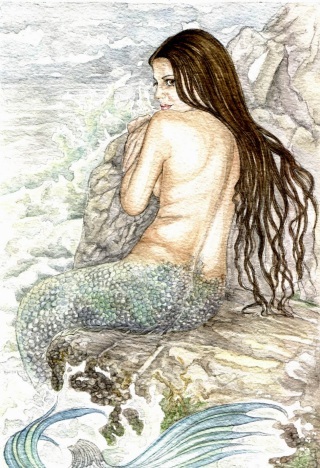 The family continued watching the mermaid from the cliff top, she looked very young and her skin was very white, her hair was dark and long and the tail could clearly be seen in the water. It used to be thought that mermaids were heavenly fish spirits that fell to earth every now and then to perform ritual dances. They removed certain pieces of their clothing to enable them to dance, and like the selkies of Scotland, if these fell into the hands of a mortal then the mermaid would have to stay with them until it was returned or found. Dancing is especially important in folklore and the different style of dances were used to bring good luck in the birth of children, hunting and wars.